Things just got better for dairy cattle in the province. The B.C. Ministry of Agriculture announced today it will adopt a new regulation to improve protection of dairy cattle within the Prevention of Cruelty to Animals Act (PCA Act). The PCA Act prohibits causing or permitting an animal to be in distress in British Columbia, including overt animal abuse or neglect; the BC SPCA enforces these laws. The new regulations will adopt the 2009 Canadian Code of Practice for the Care and Handling of Dairy Cattle (the Dairy Code) into the PCA Act, specifically outlining what is considered a ‘generally accepted practice’. Anyone causing distress to an animal while conducting a ‘generally accepted practice’ is exempt from prosecution for animal cruelty. Until now, these ‘generally accepted practices’ have not been clearly defined as they are in a number of other provinces. With the adoption of the Dairy Code into B.C. 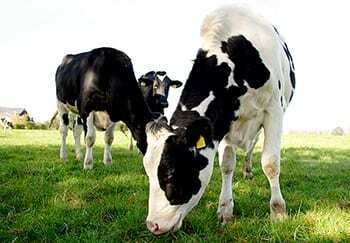 law, there will now be clear guidelines on what is and what is not a ‘generally accepted practice’ for dairy farming. The 2009 Dairy Code prohibits docking (cutting off) the tails of dairy cows and requires that pain control be used when dehorning or castrating dairy cattle. The BC SPCA is supportive of this move and congratulates the B.C. government for its continued efforts to improve animal welfare in this province. Over the past year the BC SPCA, the BC Dairy Association, the BC Milk Marketing Board and the dairy industry have been working to improve the welfare of dairy cattle, and this move by the provincial government will complement the society’s current and ongoing work. The Dairy Association and the Milk Marketing Board are supporting the new regulation, which will ensure consistency with the on-farm auditing programs they are now rolling out across the province. The Dairy Code is a national science-informed standard agreed to by consensus between key stakeholders in animal agriculture and animal welfare.